Baptism is the incorporation of a person into the community of believers. As such, it is usually administered at our main service (10:30 a.m.) on designated Sundays. In baptism, significant vows are made before God. To help people understand their commitment, pre-baptismal instruction is required for those being baptized. In the case of children, parents must attend this class. Due to the nature of baptism as a sacrament of incorporation, it is necessary to be a member in good standing of St. John's or another Christian Church in order to be baptized, or to present a child for baptism. Baptisms are administered once a month except during Lent and during the month of August. Pre-Baptismal instruction classes are held one month prior to the scheduled baptism. If a life–threatening illness requires the candidate to be baptized immediately, arrangements can be made by the family with the rector of St. John’s to administer an emergency baptism. In this instance, pre-baptismal classes are waived. Please contact the Parish office at (630) 355-0467 to schedule a baptism and a pre-baptismal instruction class. This class is designed for students in 2nd grade and older. We follow the Episcopal curriculum, This Bread and This Cup. The classes are held on the first Sunday of the month from September through April, from 9:15 -10:15 a.m.
Children learn about Holy Communion with age appropriate lessons. From a “behind the scenes” tour of the sanctuary to special activities, they will explore the Eucharist. A keepsake book is given to each child. 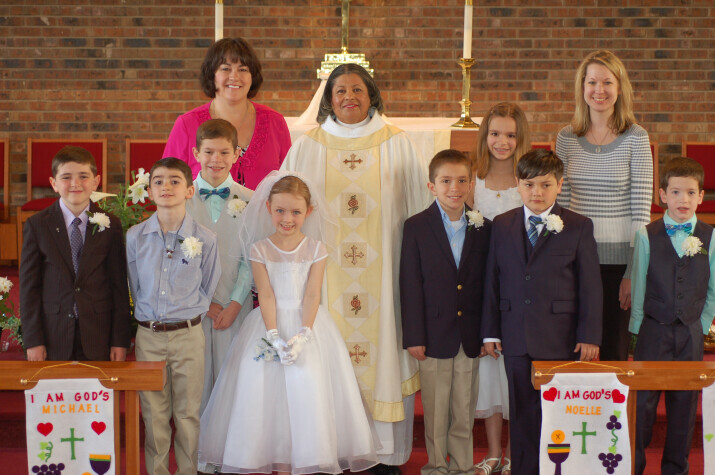 Children make their first communion at a 10:30 a.m. Sunday service in the spring. Confirmation is defined as a "mature public affirmation" of faith and commitment to the responsibilities of living a life in Christ and in the church. “Confirmation is the rite in which we express a mature commitment to Christ, and receive strength from the Holy Spirit through prayer and the laying on of hands by a bishop”(Book of Common Prayer, p.412.) By receiving the Rite of Confirmation a person confirms the vows that were made at their baptism. If you were Baptized or Confirmed in another tradition, you can be received into the Episcopal Church by the laying on of hands by a bishop. To participate in the sacrament, it is necessary to be a member of St. John’s.